True Blue is filled with old-growth oak trees, inviting lakes, and substantial natural wildlife. The resort offers villas with one, two, and three bedrooms, along with luxuries such as indoor and outdoor pools, tennis courts, a children's park, and lakes for fishing. Equally enchanting is Waterway Village, a private-gated community situated on the River Oaks Golf Plantation and the Intracoastal Waterway. The one and two bedroom condos offer kitchens, large living/dining areas, and cable TV. While there, you can also indulge in indoor and outdoor swimming, tennis, and a stroll along a lighted waterfront boardwalk. 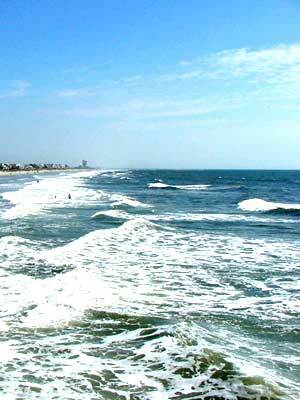 If you'd like to be within a short drive of the Grand Strand rather than in the heart of it, there's always Sunset Beach, North Carolina, with its lovely scenery and quaint fishing villages. Sunset Village, which overlooks the 27-hole golf course of Sandpiper Bay, provides vacationers with Southern, Colonial-style buildings filled with two and three bedroom golf villas, each with a large screened-in porch. The village offers a spacious outdoor pool, Jacuzzi and tennis courts and is adjacent to Sea Trails Resort. Of course, golf villas are most attractive to hard-core golf enthusiasts who wish to spend the majority of their vacation on the fairway. If you are only half-hearted about golf, you may wish to consider another type of lodging option. But if you'd like to spend every day picking up a putter, a golf resort may be your best vacation choice. The accommodations tend to be top-notch, since there is so much competition for the golf vacationer's dollar. And you'll leave knowing you got as much play in as your schedule would allow, a feeling of accomplishment that will carry you through to next year's vacation. © Copyright 1999-2005 · All Rights Reserved.